CoSchedule is a new full-featured suite that you can use for dividing social media tasks among staff members, plan your marketing efforts and remain as efficient as possible. The service is currently being used by over 10,000 bloggers, social marketers and editors and in this article we will do a quick rundown of the features that this new tool has to offer. 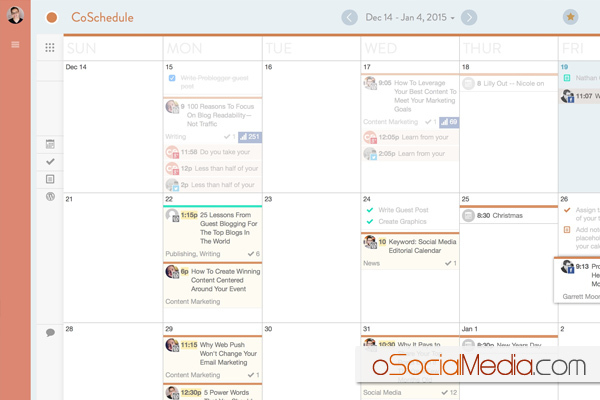 This marketing calendar tool allows you to consistently publish content that follows the same format. Set up an ongoing schedule for your workflow and utilize special wizards to create content more efficiently. It can help you to coordinate with other staff members. Adding alerts into this calendar can show staff members when updates are upcoming. You can also track all of the comments and engagement on every post of a social media for better engagement and allowing you to maximize traffic. With CoSchedule you can sketch out ideas, set deadlines and easily communicate with your blogging and content creation staff. Think of this like a massive work desk that you can record ideas, communicate with your staff and eventually publish posts and graphics from. Create content and plan your social media updates directly in WordPress. 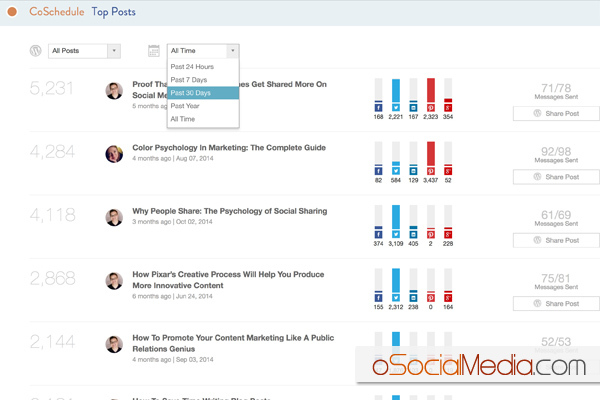 CoSchedule estimates that you will save 30 minutes on every blog post you publish. Allow your writers to write their content on Google Docs while easily managing your workflow on CoSchedule by importing Google docs and images into your Wordpress blog. CoSchedule has a mass compatibility across WordPress, Google drive, Google calendars, Google analytics, tumblr, LinkedIn, Facebook, twitter, Google plus and more. You can utilize the same tools that you are comfortable with to market, plan, design and publish but with a full collaborative scheduling software to guide your progress.